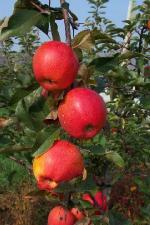 Description This old time or "antique" apple variety was an important commercial variety in the early 1900s. The fruit is greenish-yellow, medium to large with excellent fruit quality. Albemarle Pippin matures in early October and will keep in cold storage for six months. Pollination Information Albemarle Pippin blooms late season and will cross pollinate with other mid-season and late blooming apple varieties.